the toppling of the regime and detaining (of) its chief in a secure place. Al-Bashir's whereabouts is of interest because he's wanted by the International Criminal Court (ICC) for crimes against humanity, war crimes, and genocide in Darfur. The ICC's case stretches back to 2005 with the publication of a UN report that accused the Sudanese government of systematic abuses in Darfur. The United Nations Security Council then referred the suspects to the ICC. In the following years, the ICC would release two arrest warrants against al-Bashir - in 2009 and in 2010 - on several counts of genocide, war crimes, and crimes against humanity. In 2014, the ICC's Chief Prosecutor Fatou Bensouda shelved the case due to a lack of cooperation in pushing for al-Bashir's arrest. Many saw the shelving as emblematic of the court's lack of power over powerful individuals, especially sitting heads of state. The fact that al-Bashir has been deposed will again raise questions about whether there's a possibility of seeing the former Sudanese president facing trial at the ICC. Commentators have already expressed different opinions on whether he will or won't end up facing trial at The Hague. Views either highlight the fact that he's likely to face trial because he no longer enjoys the privileges associated with his position. Or that he still has influence over the new government and, as such, bringing him to The Hague would be extremely complicated. 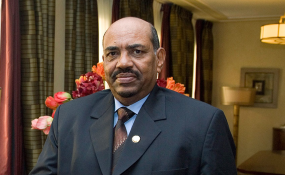 I believe the trickier question is whether the ICC should prosecute the former Sudanese president. This might seem like a redundant and even immoral question - if not him, then who? But it's not that simple. Let me be clear. I have no sympathy for al-Bashir - nor for any dictator whose policies harm, or aim to harm, civilians. But I believe the particular circumstances of al-Bashir's case mean that the court is between a rock and a hard place. That's because two very difficult issues arise out of the present circumstances. Both have serious implications for the court and its work, as well as whether sitting heads of state believe they can act with impunity. The idea behind attempted prosecutions of sitting heads of state is that they should be prosecuted - irrespective of their position - in instances when crimes of huge magnitude have been committed. Originally, the idea was to discourage sitting heads of states from committing heinous crimes by putting in place limits to the exercise of sovereign statehood. In other words, knowing that your position of power is not going to prevent international prosecution, should ideally act as a deterrent. Unfortunately, when the ICC attempted to turn this idea into pragmatic action, it met extraordinary resistance. In Kenya, for instance, the prosecution against the current sitting Head of State Uhuru Kenyatta, was dropped in 2014 after the Chief Prosecutor of the ICC, Fatou Bensouda, said it was impossible to investigate the crimes further. This was because witnesses were terrified to testify and the Kenyan government refused to cooperate. In recent years the the African Union has gone as far as suggesting that in the future the court should rather focus on mid-level officials. But if the ICC doesn't prosecute al-Bashir, it will give credit to critics who think that the court is essentially powerless against the most powerful political figures in a country. On the other hand, if it does, it would suggest that powerful individuals can only be prosecuted when they leave their positions of power. And here lies my preoccupation. If the Court prosecuted al-Bashir right now, it would be sending a worrying message to other dictators: do whatever you want, as long as you maintain power. Or, to be even more explicit, do whatever you can to maintain power. This is a strikingly dangerous message to project for two reasons. The first problematic message that taking al-Bashir to court would send involves war-torn countries. The fact that many of the cases in which the ICC is expected to act happen in regions and countries at war, the message is likely to hinder the resolution of a conflict by providing an extra incentive to those in power not to step down. Syria provides an interesting example. In the context of the country's civil war, an al-Bashir prosecution at this stage would warn Syrian leader Bashar Hafez al-Assad about what could happen if he stepped down. Given that recent diplomatic talks to end the Syrian conflict largely revolved around Assad renouncing his presidency, seeing al-Bashir facing trial could stiffen Assad's position even more. The second problem is one of perception. To see al-Bashir face trial at The Hague, the Court needs the cooperation of the newly installed military government. But, as academic and Sudan expert Alex de Waal points out, al-Bashir was a spider at the centre of an intricate web. And it's almost certain that at least parts of the new government have been involved in the crimes for which al-Bashir is wanted. Cooperation has historically meant that the Court would need to implicitly agree with the new government that it wouldn't prosecute its members. There's an uncomfortable precedent to this. The memory of Luis Moreno Ocampo, the former Chief Prosecutor of the ICC, posing for pictures with Uganda's Yoweri Museveni's government are still vivid. Back then, the major concern was about impartiality. As Mark Kersten has pointed out, this was seen as the ICC neglecting state-perpetrated crimes. The Court still needs [to recover from] this incident. Where does this leave the ICC? The situation isn't easy to solve. It seems that the power that states still retain over the Court is an insurmountable obstacle in the prosecution of sitting heads of state. I particular, their willingness, or not, to cooperate. In this sense, I think that the ICC is in a lose/lose situation. Unfortunately, developments around any case against al-Bashir aren't likely to redress these problems. They're more likely to highlight them even more.